It’s lovely to be able to treat yourself and your loved ones over the weekend and a delicious breakfast is the perfect start to the day. But treating yourself does not have to mean lots of calories or a fat-laden breakfasts. Here are some ideas for low-calorie breakfasts that are ideal for weekend mornings when you’ve got a little more time to prepare something special. Before you start preparing your breakfast, it’s a good idea to think about what you’re going to have with it and how you’re going to serve it. That’s not to say that you have to do this every weekend – how about leaving this article in a strategic place in the hope that your partner might surprise you instead?! 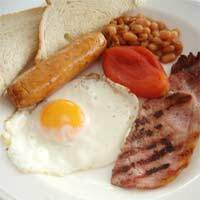 Everyone loves a full English breakfast but it’s not exactly a low calorie option. Grilling your ingredients makes it far healthier and stops you having that sluggish feeling of a fried breakfast. Start by grilling good quality sausages, one per person – they take at least 30 minutes, so don’t skimp or they’ll be too flabby and undercooked (of course, sausages are not the lowest of calorie items, so leave out if you’re really cutting back). After 20 minutes, add two rashers of lean bacon per person, turning over after 5 minutes. As you turn over the bacon, add a sliced tomato per person, sprinkled with a little salt, tiny pinch of sugar if they’re really out of season and a basil leaf or dash of Worcestershire sauce. You can also add in a couple of clean, whole mushrooms. Serve with sourdough bread or wholemeal toast. This is a delicious, light weekend treat breakfast, with the added bonus of being terribly easy to prepare. Purchase a cantaloupe melon – choose one that is not bashed or bruised and has a slight yield to the skin when pressed with your thumb. If you can only find melons that have been kept in supermarket cold distribution centres, keep it in a paper bag with a banana and it will ripen nicely over a couple of days – don’t put it in the fridge! You also need to buy some good Parma ham, although Serrano ham is also delicious and works almost as well – the saltiness of the Parma ham really cuts through the sweet melon flavour though. Have a couple of slices of ham per person, taking off the majority of the fat to keep the calories down. Slice the melon and cut it into skinless chunks to make it easy to eat while reading the papers. Long, thin slices look better if you want to serve this as a starter instead. Gently lay the ham over the melon. That’s it! This works really well with some torn mozzarella too and other sliced soft fruits such as peaches or nectarines if you want to get more of your five a day before lunch!